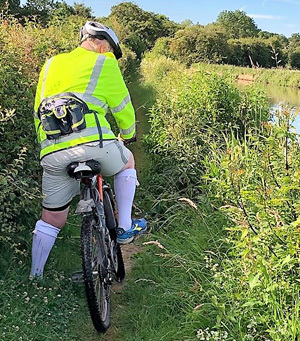 After the previous day’s relaxing pedal along the towpath of the Shropshire Union Canal, dawn broke on another fine day, with radiant blue skies, the sun shining and temperatures rising. After sleeping off a hearty evening meal and having had a good night’s sleep, there was no real need to wait around for breakfast, so with ’Tiger Balm’ liberally applied to the riders, they set forth on day two. This was planned as the longest stretch of the trip, but still kept to an achievable target. A quick snooze for Steve Walls at ‘The Boat Inn’, during the lunch pit-stop. Setting off from Autherley Stop Lock, this day would see the riders covering some 76 miles of canal, passing through Wolverhampton and Birmingham and heading southwards. Cycling along the side of the Birmingham Main Line, a long straight stretch of canal leading through the heart of Birmingham, they passed many fine old examples of the canal warehouses that once existed along its length. Today, a number have been renovated and converted into a mix of either luxury accommodation or commercial premises. These building renovations sit well with and enhance the modern additional architecture which has sprung up along the route in recent years. Rough going between Wigram’s Marina and Braunston. Exiting Birmingham via the Digbeth Branch, the riders soon joined the main arterial line of the Grand Union Canal, which would eventually take them all the way to the heart of London. However, that would be in a couple of days’ time. It was after leaving the Birmingham environs that the riders eventually met up with their ‘support team’ for lunch. This was at the 19th century public house ‘The Boat Inn’, situated in the delightfully named village of Catherine-De-Barnes. Following refreshment, the riders continued their journey and looked forward to reaching the Knowle, Lapworth and Hatton Locks. 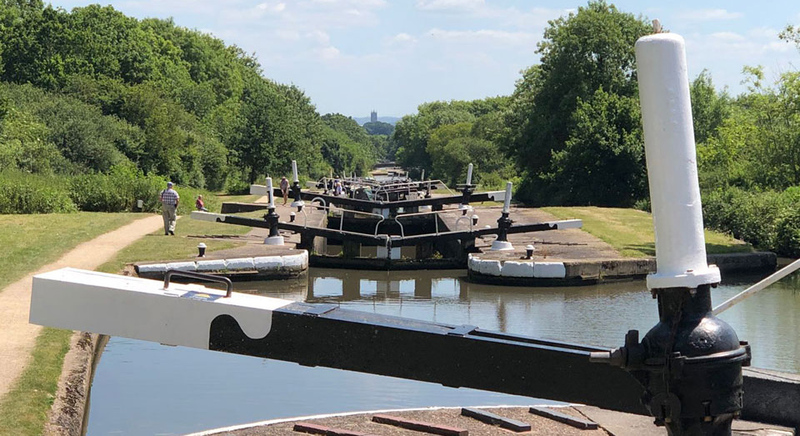 This is a series of downhill locks which allowed the riders to rest some weary muscles during the descents, before heading on towards Warwick. Just as some locks go down, it is also reasonable to expect at some point there will be locks in places where the purpose is to assist in taking the boats uphill. This was soon proved to be the case at Bascote, Staircase, Stockton and Calcutt Locks, all of which had to be climbed before reaching Napton Junction. It was on this stretch that Tony Farrar conveniently suffered his second puncture of the trip at Ventnor Marina. Having repaired the puncture the team continued, reaching the junction and taking a quick, well relatively quick left turn at Wigrams Turn Marina and then onward towards Braunston. An easy five miles, or so it was two year ago, sadly not this year, as life turned out to be not that simple. 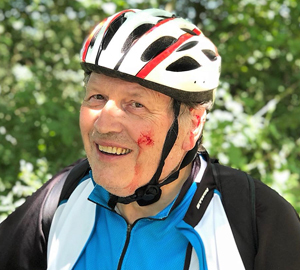 The riders faced a densely overgrown towpath, full of nettles and thorns which took its toll, slowing their overall progress to a bit of a crawl at times. In the true spirit of companionship and a hearty lungful of fresh air they pushed their best pedal forward, determined not to be deterred by what nature could throw at them and in time reached the welcoming site of a ‘finger post’ sitting proudly atop the bridge pointing the way to London. Gordon Sanford bears the scars of battle with nettles and thorns. After a few more ‘up’ locks, Braunston Tunnel was reached, a 2,042-yard-long deep tunnel with no towpath, so the riders had to dismount and carry their trusty steeds atop before re-joining the canal. A smart right turn at Norton Junction and knowing that the end of this day’s leg was drawing to a close, brought on a much-needed psychological energy boost. The team now raced onward for Gayton Junction, the final goal for the day, on the way passing the hotel where they would be staying overnight. On leaving the canal they made a short road trip back to ‘The Cross Roads Hotel’, where Steve Walls was most disappointed not to find Miss Diane and Benny in attendance, not even an old woollen beanie hanging up anywhere. After showering, a hearty meal was soon consumed, together with a couple of well-earned drinks, followed by an early night. Magnificent work once again by the ‘support team’ of Amanda Farrar, Jan Walls and John Bruffell.